There are four lunch lines in the cafeteria. Two Full Meal Deal meals and two Snack Bar lines. Hot lunches are available in the school cafeteria for the regular price of $2.75 per day, milk is $0.50 per half-pint, and breakfast is $1.75. A variety of snacks are available for purchase during morning break and lunch. Snacks purchased in the cafeteria must be eaten in the cafeteria. Students must have cash or money in their account to purchase items at the Snack Bars. Purchases made in our Snack Bar are priced according to the items being sold and are not included in the Free & Reduced Price Meal program. Home » Student Life » What’s for Lunch? 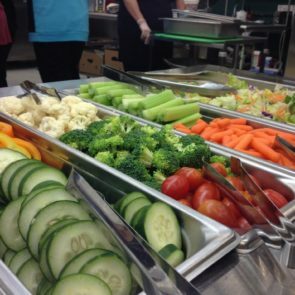 In an effort to promote a healthy lifestyle, Cheldelin and Linus Pauling middle Schools are working together with the CSD Food & Nutrition Services Department and the Oregon Department of Education to provide healthy foods in our schools. Our cafeteria has a computerized system which utilizes the account number on each student’s school ID, which they receive at the beginning of each year. If the card is lost, an additional card may be purchased in the office for $2.00. Funds can be added to the student’s account online at the link above or by placing it in a taped or sealed envelope. Please write your student’s name on the envelope and place it in the lunch money drop box located in the office. If dropped off before 11 am, your payment will be credited to the student’s account before lunch that day, otherwise the payment will be credited to the account the following morning. To purchase food, students present their ID card to the cashier and the cost of the meal is automatically deducted from their account. A student will only be permitted one charge against their account at any given time. Don’t wait until school starts to make a deposit in your child’s account! It is very helpful for the kitchen manager if the deposits are completed in advance. School menus rotate on a monthly basis. We offer a full salad bar at lunch as a vegetarian option and to encourage students to eat more fruits and vegetables. The Free and Reduced Meals program is available for students whose families meet specific household income guidelines. Please make sure your child is dressed appropriately for the weather as they will be outside every day during part of their lunch. In the event of heavy rain or severe cold, we will have Indoor Rec at lunch. When Indoor Rec is called, the blacktop will be closed and students will be in the upper and lower gyms for the recreation portion of their lunch. Indoor Rec will be announced before lunch begins. If students need to leave their rotation for any reason, they need to ask a lunch supervisor for permission and a pass. Food or drink is not allowed outside the cafeteria. Students must report to their assigned lunch (first lunch or second lunch). Students may not choose to go to a different lunch seating or “switch” rotations. The library is open during lunch for quiet reading, study, or scheduled activities. Students will wait in line respectfully, pick up their trash and trays, recycle and compost the appropriate items, and trays will be returned to the dish room. Students will include classmates in games, return balls to the ball cart, and remain on the blacktop, track, or grass area. Fat- No more than 35% of total calories from fat or 7 grams maximum per serving (with the exception of nuts, seeds, peanut and other nut butters). Saturated and Trans Fat- No more than 10% of calories from saturated fat and /or trans fat, or 2 grams maximum per serving. Added sugar- No more than 35% by weight or 15 grams maximum per serving (excludes sugars naturally occurring in fruits, vegetables and dairy). Milk- No more than 27 grams total sugar per 8 oz serving for skim or 1% flavored milks (15 grams of added sugar and 12 grams of naturally occurring lactose or mil sugar). Dairy products- Serve only low-fat dairy products (skim and 1% milk) and phase out whole milk. Limit portion sizes of all beverages and snacks- limit portion sizes so that they are nutritionally reasonable.